Originally added to McGreer Hall in 1909 to serve as the University Library, this wing was converted into office space during the 1970’s when McGreer was occupied by Champlain Regional College. After Champlain moved into its own building in 1993, work on restoring the library wing was completed in time for the Sesquicentennial celebrations in 1993-1994, which culminated in a sherry reception for the Governor-General. The room regained its original name, the Old Library. 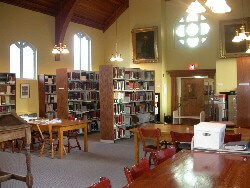 The Old Library serves as the consultation room for the University Archives and the Archives Service of the Eastern Townships Resource Centre, the special collection of books pertaining to the history of the Eastern Townships, Canada, and special volumes concerning Bishop’s University. Used year-round by faculty, students and the local community, the room is especially popular during the summer months when people from across Canada and the U.S. come to do family research (genealogy). The room is also used throughout the academic year for lectures, workshops and other special academic events. The room may also be used simply as a study hall – a quiet place for everyone. The Old Library contains books, pamphlets, newspapers, and maps pertaining to the history of Canada and the history of the Eastern Townships. In addition to the valuable Mackinnon and P.H. Scowen Collections, the Old Library also houses many publications of the 19th century, town and parish histories, catalogues for births, deaths and marriages, and doctoral and masters theses. Available on microfilm are Canadian nominal census returns, civil status registers, and a selection of Eastern Townships newspapers. The entire collection of The Record (formerly The Sherbrooke Daily Record) is housed in the main library.